This morning I read an incredibly scary news story. The Environmental Working Group (= great organization!) analyzed more than 500 “food” items and found that they contained “a potentially hazardous industrial plastics chemical.” It’s a chemical FOAMING agent. No kidding. Anyway, because of our wonderful Micia, my parents and I have always had a “thing” for black cats. Amazingly, though, most people don’t like black cats, mainly based on ancient (absurd!!!) superstitions. Well, here’s a news flash: we’re not in the Middle Ages anymore. And black cats, like all cats, are wonderful, devoted life companions. So Muffet was taken to the cat shelter because she got “NERVOUS” around the grandchildren, huh??? I mean, instead of showing the grandchildren how to treat an older cat, the grandparents chose to get rid of her. Oh boy, that’s a great lesson to teach the grandchilden, isn’t it? Shameful. Unfortunately, this is not an isolated story. It happens a lot. And it makes me so incredibly angry. Well, I want to tell you that Muffet is the PERFECT cat for my parents. She is absolutely LOVELY, in every sense of the word. My parents have gone absolutely bonkers over her and talk about nothing else, practically. What she eats, what she does, where she goes, etc. It’s all about super Muffet. As it should be. And thank you, MSPCA (about 10 days ago, I wrote the MSPCA a private thank-you note, by the way, to which I received an enthusiastic response, which was verrrrry nice…I will send them the link to this post, too…). This morning, after doing some work (as usual), I finally got around to going through the copious notes I took during the patient-doctor meeting with Dr. Morie Gertz (Mayo Clinic in Minnesota) that took place last month, on January 18, right here in Florence…well, just outside Florence, to be exact. In this post I’m going to focus on the new/most interesting bits of his excellent presentation, which compares myeloma to a garden that is more or less choked with weeds. I’ve heard, and written about, the presentation before (do a search for “Morie Gertz” on my website, using my handy “Search” box, = top, right-hand side). I still took notes on it, since I find it fascinating, so if you have any questions or comments, please get in touch with me, and I can check my notes for you. A bit further on he added that the average patient at diagnosis has 30% plasma cells in the bone marrow. More plasma cells = fewer red blood cells, as we know. And anemia, which gives us fatigue and shortness of breath, is a “cardinal feature of myeloma.” It occurs, he said, in 70% of MM patients. But how does a doctor figure out that someone–without any obvious symptoms such as the above-mentioned ones–has myeloma? The first signal, he said, is increased protein in the blood. Total protein is mostly the sum of albumin and globulin, he said. A normal person has more albumin than globulin…say, 40 and 30, respectively. But if the numbers are 35 and 50, well, that’s “abnormal.” Total protein is a “useful marker of disease activity,” he added. A few of the patients at the meeting had had allogeneic stem cell transplants, so he talked about allos a bit. Again, if you’re interested in this topic, write to me, and I’ll try to transcribe that part of my notes for you. Note: he confirmed what I’ve read about our immune system not being very good at recognizing and exterminating MM cells. Big problem. Just my opinion, as usual! Today a blog reader/friend (merci!) sent me the link to a very interesting Science Daily article about the superhero-strong antibacterial properties of one of garlic’s chemical compounds, called ajoene: http://goo.gl/W0oNCc While we already knew about the antibacterial activity of garlic, the Science Daily article has some new information that I found really interesting…And that is why I would like to recommend it in particular to those who suffer from (recurrent) infections–a big problem for many myeloma folks. Okay, quick change of subject. 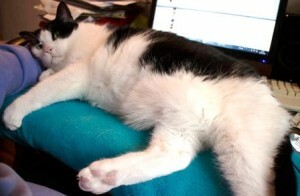 Yesterday, while I was working at my computer, my big boy Piccolo jumped onto my desk and draped himself between me and my keyboard, purring like mad. I had to stop working, of course…I mean, I couldn’t reach the keyboard anymore! Anyway, he looked so adorable and loving that I just had to take a few photos and share at least one with y’all! I was sorry to read that the curcumin diet (by the way, it was a curcumin, NOT a curry diet!) was ineffective. We have to keep in mind, though, that we are humans, NOT mice…and so I will continue to put some curcumin powder in my food, whenever possible…I just put some in Stefano’s homemade broth that I had for lunch, in fact…yummmmmmmmy! But let’s not forget this: a few years ago Prof. Aggarwal told me (in an email, in answer to one of my questions) that curcumin is absorbed by our tissues within a few minutes of ingestion. Ah. A couple of years ago, when I began preparing my “Good or bad for myeloma” Page (http://margaret.healthblogs.org/good-or-bad-for-myeloma/), I decided to add aspirin to the list of stuff that is possibly “bad” for myeloma because it seems to increase our TNF alpha levels (see my 2011 aspirin-myeloma post for more info: http://margaret.healthblogs.org/2011/03/28/to-use-or-not-to-use-aspirin-in-myeloma-conventional-treatments/). Well, I have some new information on aspirin that has made me rethink my position. A few blog readers recently directed my attention to Dr. Durie’s recent post on aspirin. Well, it seems that aspirin MIGHT REDUCE the risk of developing myeloma: http://goo.gl/1VrKWh An excerpt from Dr. Durie’s post: A key question is: “Can aspirin use reduce or prevent the activation of MGUS or smoldering myeloma into full blown myeloma?” A tantalizing question indeed! Carefully designed prospective studies are definitely warranted. I couldn’t agree more!